FILE - The U.S. Capitol building is seen at sunrise in Washington, Feb. 9, 2018. The U.S. Senate is preparing to vote on competing partisan efforts to end a partial federal government shutdown, now in its second month, but neither proposal has an easy path through Congress to reach President Donald Trump's desk. On Thursday, the Senate is expected to vote on a Republican measure incorporating Trump's $5.7 billion demand for wall construction along the U.S.-Mexico border, plus limited immigration reforms, in a package to fund the government for the rest of the current fiscal year. The Senate also will vote on a Democratic proposal to fund the government through Feb. 8. The measure contains no border security or immigration provisions and is designed merely to reopen shuttered federal agencies and provide a window for congressional leaders and the White House to strike a deal on outstanding issues that provoked the funding impasse in December. "There’s no excuse for Senate Republicans not to pass this legislation," House Speaker Nancy Pelosi told a weekly press conference on Thursday, referring to the Democrat's proposal. Senate Majority Leader Mitch McConnell of Kentucky urged Democrats to embrace the Republican measure, which would provide temporary protections for immigrants brought illegally to America as children, some of whom have been shielded from deportation by an Obama administration program known as DACA, which Trump has sought to terminate. 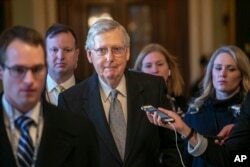 "It's time to make a deal, and fortunately, a deal is on the table," McConnell said. "It's a deal for everyone who would rather reopen the government, invest in border security and secure more certainty for DACA recipients." Senate Minority Leader Chuck Schumer, a New York Democrat, had a different take, saying the Republican proposal amounts to "holding 800,000 [federal] workers hostage, millions of Americans hostage, unless the amendment's authors [Republicans] get their way [on a border wall]." Of the Democratic measure, Schumer said, "We're not demanding anything. Just open up the government, and then let's discuss it [border security]." Neither proposal can pass the Senate without bipartisan support, since 60 votes will be required to advance either measure in the 100-member chamber. Republicans have a narrow 53-47 Senate majority. Congressional action is not limited to the Senate. The Democrat-led House of Representatives has passed multiple bills restoring federal spending authority but omitting wall funding from all of them. Reports from Capitol Hill say House Democratic leaders are working on a new proposal that would add billions of dollars to an array of border security measures favored by the White House short of constructing new physical barriers on America's southern border. A man looks out at the U.S. border where workers are replacing parts of an existing wall with a higher one, in Tijuana, Mexico, Dec. 19, 2018. Republicans have hailed Trump's proposal as an effort at compromise, and House Democrats said they are attempting to do the same. A growing number of lawmakers of both parties have said compromise is the only way to end the political stalemate and reopen the government. ​"It is long overdue for all sides to come together, to engage in constructive debate and compromise to end this standoff," Maine Republican Sen. Susan Collins said. "Shutdowns represent the ultimate failure to govern and should never be used as a weapon to achieve an outcome." Virginia Democratic Sen. Tim Kaine expressed grave reservations about Trump's proposal, but said it deserves serious consideration as a starting point for negotiations. "These are issues we could debate. 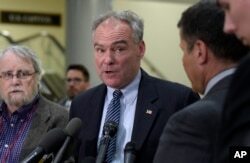 These are issues where amendments could be offered and we could find, I believe, a compromise," Kaine said. "We ought to have that discussion and offer Democrats and Republicans the ability to take some sandpaper to it and try to make it better." The shutdown has furloughed 800,000 government employees, with at least 420,000 still working without pay and the remainder sent home, some of whom have been forced to look for temporary work elsewhere to help pay their household bills. All are set to miss their second biweekly paycheck on Friday. Ken Bredemeier, Chris Hannas, Wayne Lee and Steve Herman contributed to this report.